In Australia we have a huge number of varieties of ants and each type follows the basic structure of living and working in colonies with their populations being made up of worker and soldier ants plus a single queen. Their colonies tend to be permanent in nature and can be located in soils outdoors where their activity can be seen by the deposition of soil on footpaths, gardens etc. They will also nest in timber under pavers, in wall cavities and in roof voids so knowing how to get rid of ants can be a priority. Ants are a highly developed social insect that will travel long distances for food following trails they’ve established and clustering around their food and becoming an unwanted nuisance in Western Australian homes and businesses. Note: Termites (commonly called White Ants in Australia) are not related to ants. They have different body structures and different eating habits. Ants may not seem to be a destructive insect and in a lot of instances may be seen to be more of an annoyance than anything else however they can cause problems so ant control and even knowing how to get rid of ants can be very important. Ants themselves generally aren’t infectious disease ridden insects rather, they can tend to be disease carriers bringing possible germs into your home. 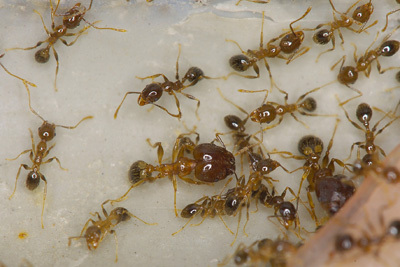 Coastal Brown Ants, for example, can carry disease organisms such as dysentery and smallpox as well as bacteria such as Salmonella. Ants can also be aggressive in nature particularly in Western Australia with Bull Ants quite capable of inflicting a nasty bite to the unwary … a not uncommon occurrence on a Sunday afternoon BBQ! Ant problems sometimes aren’t that obvious. Whilst ants don’t eat wood, they can nest and live in it quite comfortably and from there can travel to other areas such as electrical or hot water systems where their activities have even been known to causes short circuits and even fires. 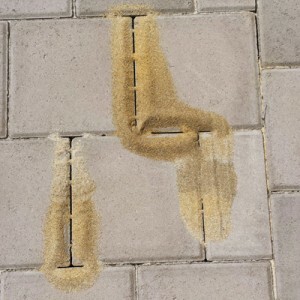 Outdoors, ant activity can be seen on the surface however more damage may be occurring under pavers or concrete where cracking damage may be happening but may not be visible. In Australian backyards, it’s not uncommon to see pavers drop or become uneven due to ant tunneling and how to get rid of ants causing that destruction may prove to be quite a difficult task. 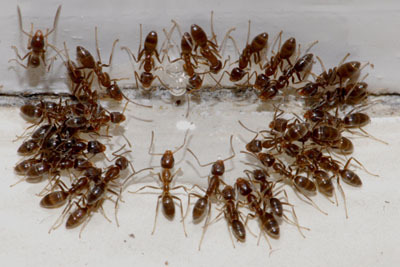 Ants are one of the most difficult, if not THE most difficult type of insect to control. At any one time, what we see on the surface is only 5% of a colony. “Old” remedies such as pouring boiling hot water or petrol over the ants, or spraying them with hardware store bought repellent dust, will only be temporarily successful as the majority of the colony will remain safely underground and will simply relocate or resurface a few weeks later. External – Location & treatment of the nest. This is by far and away the best ant control method. The ant nest is located and treated with an appropriate liquid insecticide to flood the tunnels and galleries. The insecticide we use has a particularly long residual life in soil and is ideal for both barrier and nest treatment. Internal – Baiting treatment. 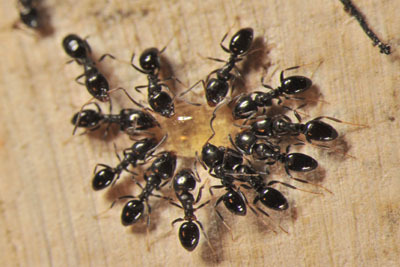 This method involves exploiting the ant’s food foraging activities and uses a specific bait that is taken back to the colony where it can target many more members of that colony including the queen. An attractant bait is offered to the ants in a very small plastic prism (ant ‘café’) and even though these cafes may reside in an accessible location, their design won’t allow access to the bait from children or pets. 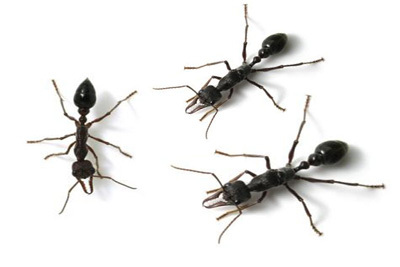 Contact us at Perth Pest Control for details of how we can solve your ant problems.